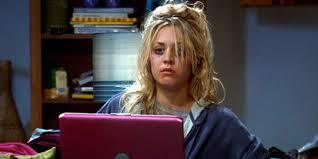 New article BY MOI – Online Shopping: Is it really Safe? 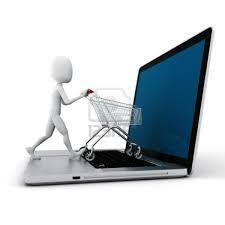 Have you ever sold something or bought something online? I’m guessing that most people have – either because the item in question is cheaper, not found in Malta, more to our taste, or for any other reason, buying and selling things on the world wide web has become something common and for many, even a pastime. 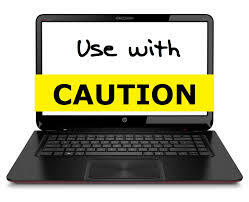 One must be very careful when dealing with monetary transactions online however, since obviously, there are traps and pitfalls one can encounter on the internet, which are quite different from the ones present when you buy an item from someone face to face. Just the other day for example, I was browsing through Maltapark.com and came across something which I thought would make a good anniversary present for my other half. I contacted the seller, asking more information about the item, however the seller refused to give this information, telling me to contact him on his mobile phone instead. While I understand that it is easier to communicate on the phone than through email or chat, I decided to wait a couple of days, until I perused more websites as well as a couple of stores for the same item, in order to compare prices. I also dislike giving my mobile number to strangers, which is another deterrent when buying something from Maltapark.com (websites like ebay.co.uk or amazon.com are more comfortable in this regard, since they do not need your mobile number, just your address for shipping purposes). I sent an email thanking the seller for his help, and that was that. Lo and behold, as soon as I opened my email on Monday morning, I found a very abusive communication from this Maltapark seller, calling me a miser and a time-waster (as well as other unsavoury things) because I hadn’t called him after all. Needless to say I was astounded. Was this the way one treated prospective clients? Of course not. However the fact that this seller was hiding, so to speak, behind his Maltapark username, as well not having to face an actual person ‘in real life’, seemed to have developed the idea that nasty and uncalled for behavior was acceptable. In other words, he felt like he had nothing to loose, so, being anonymous behind his screen, he felt free to vent his frustration at me when he thought that I was not going to buy the item from him. Bad mistake. In fact, I had been about to contact him again, however this episode established that I wouldn’t buy anything from him in a million years for sure, which is what I told him. Thank all the gods I never gave such a person my mobile number, and that Maltapark is not a website which, as such, facilitates such monetary online transactions directly through one’s bank account. Even though online sellers and buyers never actually see the person they are doing their deal with, there is still normal civilized etiquette to consider. Just because you don’t meet someone face to face, does not give you the lee-way to transform into a nasty beast. Apart from the fact that a person who hasn’t bought anything from you today, may very well buy something tomorrow, or recommend you to someone else – what about normal human decency? Why do some people feel it’s ok to degenerate into squalid baboons, just because they are hidden behind a screen? In the case I mentioned, the transaction (thankfully) never actually took place, so certain problems were destroyed at the root. Things however, can get even worse once one actually pays online and sends the money for an item which, for example, never arrives. How does one get his/her money back? 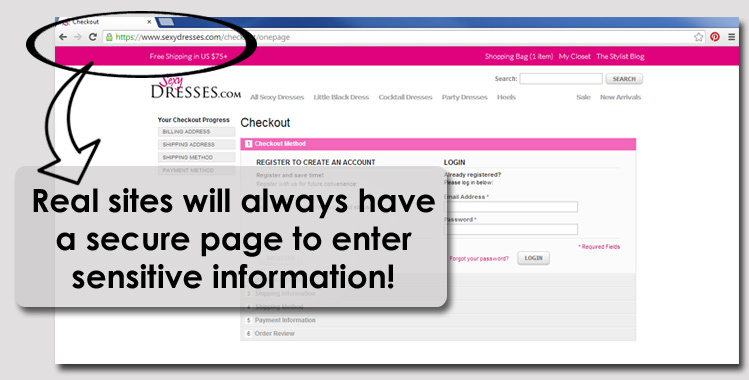 In some cases, like for example when one buys from ebay.co.uk (especially using security websites like paypal.com), there are actual contractual clauses that each seller using the site is forced to adhere to, unless they want to be penalised. However when it comes to other, perhaps less popular or well-known sites, this is not the case at all. What about those sellers or companies which sell you one item, but send you another? How can one complain and enforce their purchase after it’s done, especially if the seller in question lives in another country, and refuses to reply to any emails or calls? It is easier for sellers to entrap or misguide buyers, than for buyers to do the same. This is because generally, sellers only post the required item after they have received payment, thereby mitigating any chances of fake transactions or fraud. On the other hand, unless the website used contains the necessary policies and structures, buyers are very much naked amidst the fury of the storm, so to speak, in that they have to trust implicitly that the seller will post the right item at the right address, and not just take the money and run. 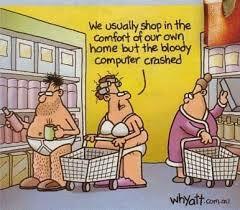 What do you think about buying something online? 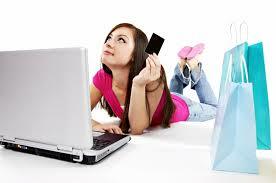 Have you ever been cheated in an online transaction? 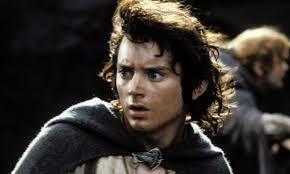 New Article BY MOI – Did Hobbits really Exist?? It was 2003 when a team of researchers found her – a woman whose bones were 18,000 years old and whose skull was less than one-third the size of our own. This was the woman to be nick-named ‘the Hobbit’, after J. R. R. Tolkien’s renowned book of the same name. Led by anthropologist Peter Brown and archaeologist Michael Morwood of the Australia’s University of New England, the team was excavating a limestone cave on the remote island of Flores in Indonesia when they discovered a nearly complete skeleton estimated to be about 1.06m (3ft 6inches) tall. The partial skeletons of nine other individuals, all of them less than 1.09 metres in height, were also found. 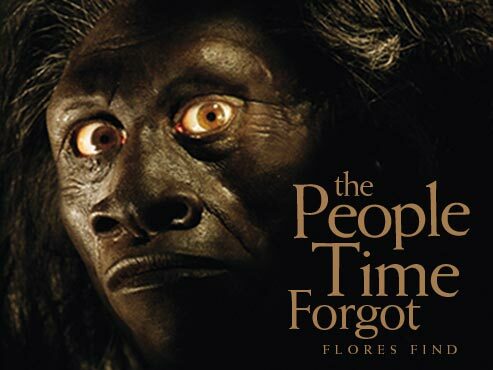 The hobbits of Flores created a storm among anthropologists, causing them to question previous assumptions about evolution and human origins, since they could not actually determine whether these humanoids represented a species distinct from ‘modern’ humans, that is, Homo Sapiens, since they seemed to have existed in the world in the same space of time, yet were distinctly different physiologically and anatomically. 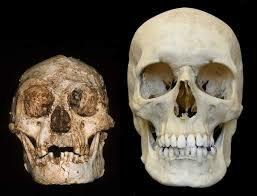 The ‘hobbits’, or as they are actually called scientifically the ‘Homo Floresiensis’ are remarkable in that even though they had a very small body and brain, they not only could craft and use sophisticated stone implements, which were found in the cave with them, but also lived until relatively recent times – as recently as 12,000 years ago, making them the longest lasting non-modern human species, surviving long past the Neanderthals. It is thought that during the most recent glacial period, these Hominids were left isolated on Flores due to high sea levels. This led discoverers to believe that the species or its ancestors could only have reached the isolated island in the first place through water transport, perhaps using bamboo rafts, which would further point out their mental abilities, as well as prompt scientists to believe that they could communicate and had a language, since they obviously needed to cooperate with each other to reach their destination. The isolation of the island is a factor which, many believe, led to the evolution of this different species, if such it is. There exist in fact, a huge number of theories which try to explain this so-far unknown strand of the human evolution tree. The ongoing dispute concerns the issue of whether Homo Floresiensis is actually a species in and of itself (like Homo Erectus and Homo Sapiens), or whether the skeletons found belonged to a group of people who were merely suffering from some type of condition or mutated syndrome. Critics of the claim for species status have put forth several hypotheses – one of these for example, states that the limited food supply in such a confined environment could have caused the body of a Homo Erectus group to evolve a smaller body, and therefore suffer from dwarfism. Anatomist Gary Richards on the other hand, introduced a new sceptical theory stating that the unearthed skeletons might have belonged to a group of people suffering from Laron syndrome, which is a genetic disorder causing a short stature and a small skull. There were even those who thought that these traits could be attributed to ‘modern humans’ (that is, Homo Sapiens) with Down Syndrome. 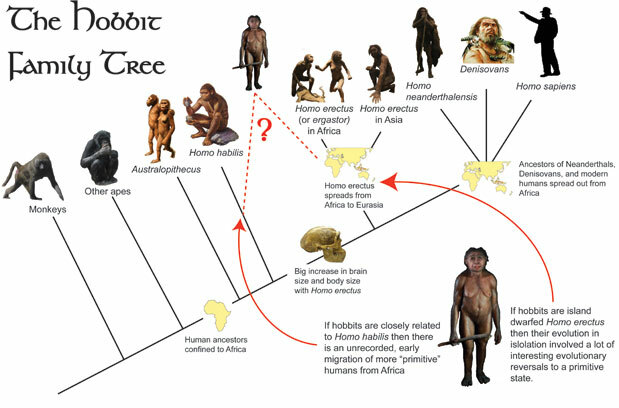 The main argument of those who support the idea that the Indonesian hobbit is a species in and of itself, mainly describe the fact that the bone structure found in the skeletons’ shoulders, arms and wrists are very different from those which stemmed from the Homo Sapiens, being much more similar to the bone structure of chimpanzees or earlier hominids. 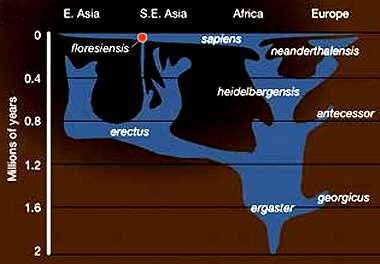 This supports the theory that the Flores hobbits were a separate species of early human, stemming perhaps, from the Homo Habilis, rather than a group of Homo Sapiens with a physical disorder. In 2012, an American film studio was going to release a movie entitled ‘Age of the Hobbits’ which depicted a community of Homo Floresiensis, and was scheduled to be released right after Peter Jackson’s ‘The Hobbit: An Unexpected Journey’. 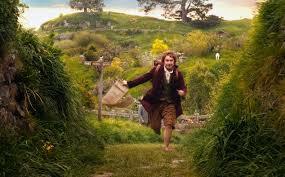 The studio was embroiled in a lawsuit for copyright infringement, and ordered by court not to use the word ‘hobbit’. The film was instead released under the title ‘Clash of the Empires’.